"Disclaimer: I received a free sample of Gatorade Endurance Formula (Watermelon) and Gatorade Endurance Gels (Mango) as part of being a BibRave Pro. Learn more about becoming a BibRavePro (ambassador), and check out BibRave.com to review find and write race reviews!" Fueling has never been my strong point. I'm much more of a fly by the seat of my pants type of runner. It hasn't always panned out, let's be real, it's been a struggle. Gel's have always been weird on my stomach so I stopped using them. Gummies are great but just the fact that I have to chew them *yeah I know, I'm insane* bugs me on my road runs. I was super excited when this campaign was brought up with BibRave. I've always loved Gatorade in general and it seemed like it would be right up my alley. Then I learned more about what exactly Gatorade Endurance was all about and I got even more excited. I'm an endurance athlete (yeah it feels weird saying that). Anyway, I run for long periods of time and know that if I have any chance of completing my 50 miler this Fall, I need to be smarter about what goes into my body. I want to try anything and everything possible to get my body into top performance shape. Gatorade Endurance Formula has jumped to the top of my list. I won't ever go on any long run without it from here on out. "Gatorade Endurance Formula is a specialized sports drink with nearly twice the sodium and more than three times the potassium of Gatorade Thirst Quencher to help sustain hydration, maintain proper fluid balance and replace key electrolytes lost in sweat during training and racing. Reformulated in 2017, Gatorade Endurance Formula contains no artificial sweeteners or flavors and has a lighter flavor designed for athletes training and racing for prolonged periods of time. 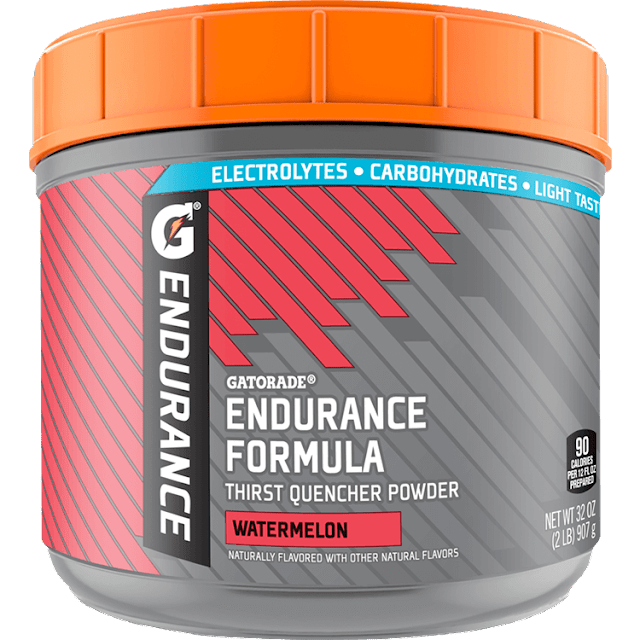 In addition, Gatorade Endurance Formula now offers a multi-carbohydrate blend to help endurance athletes maintain performance and lower the risk of stomach discomfort during a long (2.5+ hour) training session or race." Starting in July I'm training for a huge race, so these past few weeks I've been testing out products I may want to incorporate into my race day kit and this Gatorade Endurance Formula is a no brainer. It's light and easy to drink, I don't feel like I need to guzzle a ton of water post drinking it. It's such a great change from other sports drinks that are thick and super sugary. They all have always left me wanting more during my workouts, not with Gatorade Endurance Formula!! On top of the Endurance Powder Formula, we have the Gatorade Endurance Gel packs. Guys, this is WHERE IT'S AT! I don't do gels, seriously, ask any of my running people. I despise them, they're thick, sticky and I need about a gallon of water to just get back to normal after taking one, not to mention that my stomach just can't handle them. I always feel super sick after taking gels. Needless to say I was skeptical when testing out Gatorade's Gel Packs. I honestly thought, "Yeah, yeah, yeah... I've heard the song and dance before, I'm not expecting anything spectacular." Boy was I wrong, these are so light and easy to take, when I opened the first one I wasn't prepared and squeezed it everywhere on the track! I couldn't help by laugh at myself. Then I tried what was left and was shocked. I tested it out on some short runs just to make sure and then eased into a little bit of a longer run, again still not entirely convinced. After a couple weeks of incorporating these gels into my plan, I'm sold. These will absolutely be a part of my kit for the Fall and from here on out! Bottom line, I'm bad at fueling, I need to fuel better and I needed a reason to try out new products because my stomach is sensitive. Gatorade Endurance has passed every single test with flying colors. Even my sister comes over to workout and immediately goes, "So I'm stealing some of your Gatorade powder before we start." I'm a customer from here on out. This product will come up in my posts from here on out, you can count on that! If you're like me, or even if you're not, I would HIGHLY recommend checking them out, give them a try... I can almost guarantee you'll thank me! What flavor of Gatorade Endurance Formula are you most excited to try?!? !